TORONTO, ON – As promised earlier this year, Spearhead Brewing has brought a second brand to the retail sales market in Ontario. Moroccan Brown Ale is a full-flavoured American style brown ale with a Moroccan accent. Inspired by the flavours of the Maghreb region of North-West Africa, this unique brown ale is made with dates, figs, raisins and a dash of cinnamon. It is unfiltered and naturally carbonated and has all the complex flavour and bouquet of a fine red wine with notes of plum, brown sugar and dried fruit. 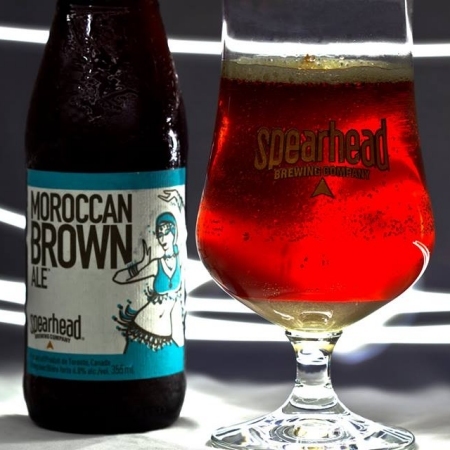 Spearhead Moroccan Brown Ale is available now at select LCBO outlets, with distribution set to increase soon. It is selling for $13.95 per six pack of bottles.